For many, Christmas just isn’t Christmas without a blanket of snow on the ground. Then there are those who would prefer a blanket of alabaster sands. If the latter is more your style, Christmas on Curaçao may be an ideal festive selection. This Netherlands Antillean island, the former Dutch colony off the coast of Venezuela, also celebrates Christmas on December 25. The earlier and more important occasion, however, may be the eve of St. Nicholas Day on December 6. Some children leave out a shoe filled with carrots and hay, as well as a bucket of water for St. Nick’s white horse. Upon awakening, if they were good all year they find the carrots and hay replaced with gifts. On December 10, a Children’s Christmas Parade wends its way through the streets of Willemstad’s Punda district. One may see the Dutch Sinterklaas and his helpers called “zwarte pieten.” Black Pete was a name for the devil in the Middle Ages, the dark evil one over whom St. Nick triumphed. Racial references came later, but the current popular explanation is that the helpers have been down so many chimneys delivering gifts that they cannot wash off the soot. Traditional holiday foods are cured hams, smoked mackerel, pickled salmon, and local poultry with hot peppers – a key ingredient in most dishes. But, like many North Americans, we looked forward to consuming a big bird for Christmas dinner. The turkey here is usually prepared with garlic powder, curry powder, and a Dutch “Maggi” sauce. A typical dessert is a regular pound cake. But our Christmas bird was certainly no turkey. We headed to the island’s Ostrich Farm to meet and eat the feathery residents (in a nice way, though). 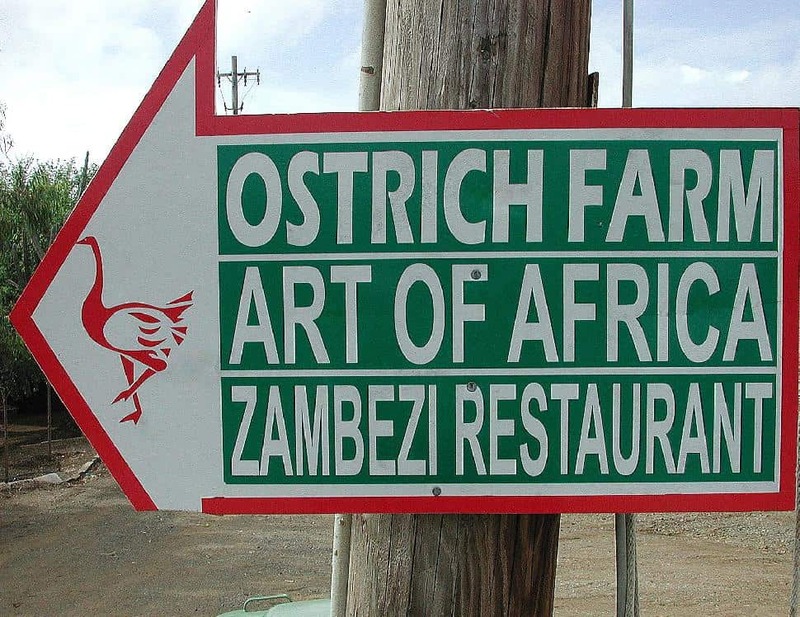 Situated in the northeastern section of the island, the Ostrich and Game Farm has operated on a 81-hectare property since 1995. Boarding a zebra-striped jeep with wooden benches, we toured the grounds in a group. The ostriches gather and crane their necks over the fence to eat food pellets in a frenetically funny fashion from the big bowls provided. Holding the pellets in my hand, I felt something like a rubber mallet pounding my palm as they voraciously devoured the food in nanoseconds. 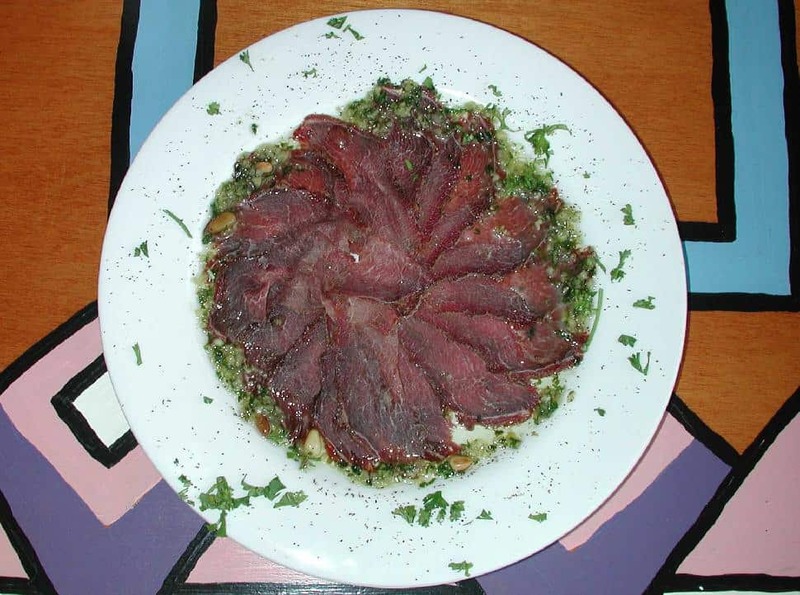 At the open-air Zambezi Restaurant we were offered a sampling of smoked ostrich carpaccio in pesto sauce. Appearing as a reddish-brown meat with a beef-like texture, it had a rich heavy flavour. I decided it was an acquired taste and that it was not a candidate for a fast food franchise (yet). Their menu features ostrich steak, stew, stir-fry and soup. Also available is ostrich egg quiche, croquettes and grilled ostrich liver. 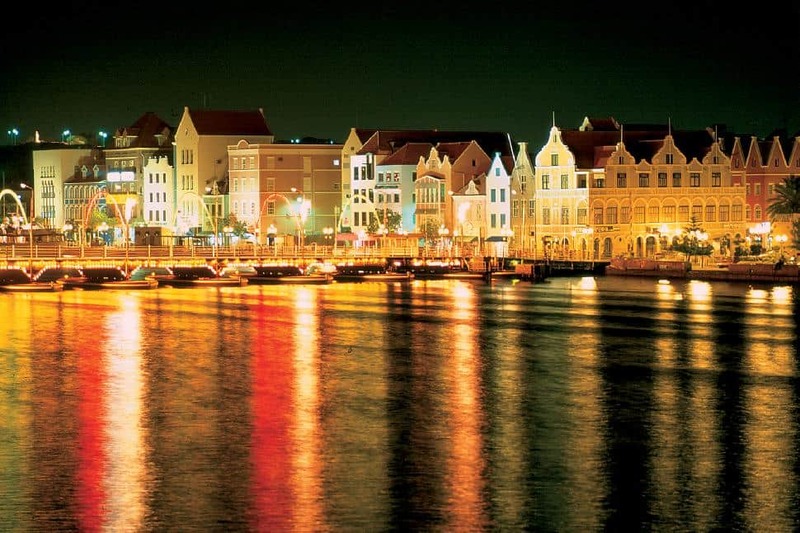 Later, we strolled along the waterfront of Curaçao’s capital, Willemstad, a UNESCO World Heritage Site. Handelskade is a narrow street delightfully dotted with visual vibrancy. 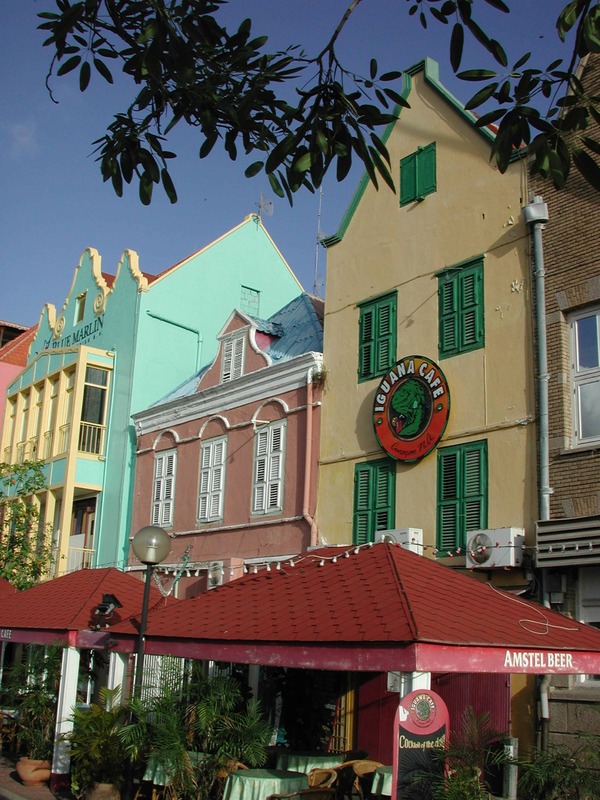 The Dutch colonial architecture lines the pretty, pastel-painted promenade parallel to St. Anna Bay; the citrus and bubble-gum coloured buildings give the bay-front a unique European flavour. And the shimmering watery reflection evokes a veritable storybook look. 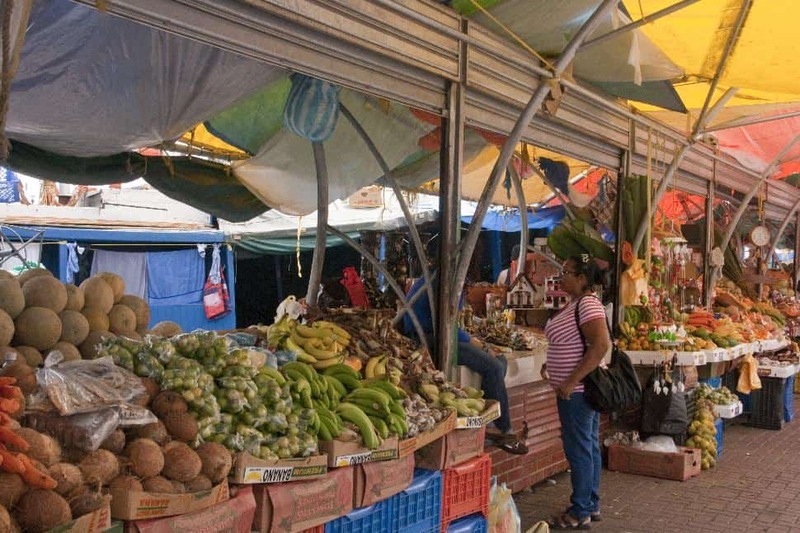 Passing by the “Floating Market” where Venezuelan vendors supply fresh fish, fruit and vegetables to the public, we arrived at the “Old Market” to enjoy a genuine Curaçaoan culinary experience of krioyo (local fare). Here the locals congregate for hearty portions of traditional specialties: kadushi stopi (cactus soup); kabritu stoba (goat stew); piska hasa (an island-style red snapper); and funchi (a corn-meal-style side dish) are all menu. 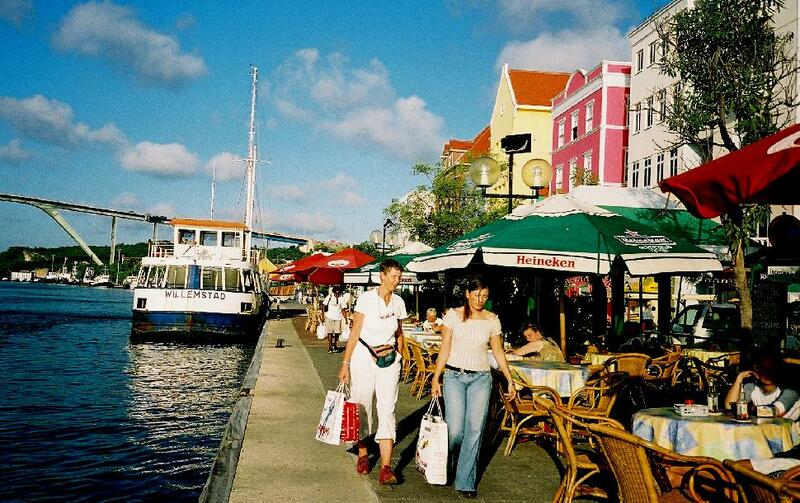 Alfresco dining abounds in Willemstad in bistros, sidewalk cafés and restaurant terraces. An alluring logo beckoned us to the Iguana Café where we ordered a few local libations. Amstel Bright, served with a lime wedge in the bottleneck, is a refreshing brew. The local Amstel Brewery is the only one in the world to produce its beer from desalinated seawater. While many residents bottle rum punch in November to age prior to festive consumption, the island’s signature drink is the delicious Curaçao liqueur. Senior & Company’s Curaçao Liqueur Distillery produces the authentic namesake, made from the dried peels of the bitter Laraha oranges indigenous to the island. The original liqueur is clear, however, various coloured and flavoured versions are available. From the Punda district we cross the “Swinging Lady”, the Queen Emma pedestrian bridge, to the Otrobanda (“other side”) district. You feel as if you may have over-imbibed while crossing, however, the marginal pitching and rolling movement of the pontoon base is the culprit. This side of Willemstad was of dubious repute and disrepair when we initially visited the island more than 20 years ago. 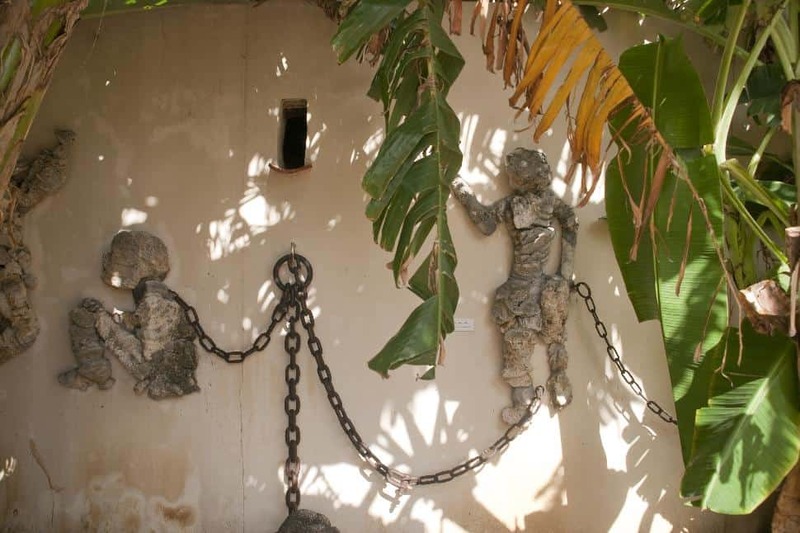 It was revitalized as the millennium approached by Dutch entrepreneur, Jacobb Dekker who developed Kura Hulanda, which translates from Papiamento (the indigenous language) into “Dutch courtyard”. 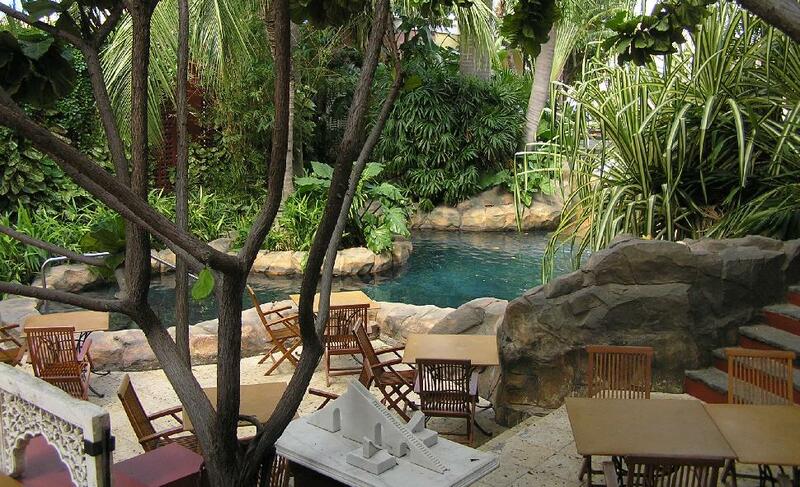 This is a beguiling eight-block, multi-cultural oasis with three restaurants enhanced by the idyllic environs. Continuing our view ‘n’ chew excursion, we drove to Westpunt (west end) passing through the cunucu (countryside) for some local and Caribbean cuisine. A popular fixture, Jaanchies Restaurant has been operated and hosted by three generations, attracting locals and tourists alike for more than 60 years. When I inquired about a menu, the congenial restaurateur replied, “Anything is possible” (there is no official written menu). “The selections are all upstairs,” he said, tapping his head with his finger. Complete with animal sounds and assorted gestures, he conveys his offerings to his patrons. Consequently, a cornucopia of culinary creations arrived conga-style at the table: iguana, goat, barracuda, mahi mahi and red snapper, accompanied by red beans and brown rice. The iguana is slightly boney and similar to pork, while the goat was reminiscent of a very tender beef. All were perfectly prepared and pleasing to the palate. Following our marvelous mélange of meals, we decided to at try our hands at cooking local. So we headed for a kitchen — Angelica’s Kitchen, to be precise. 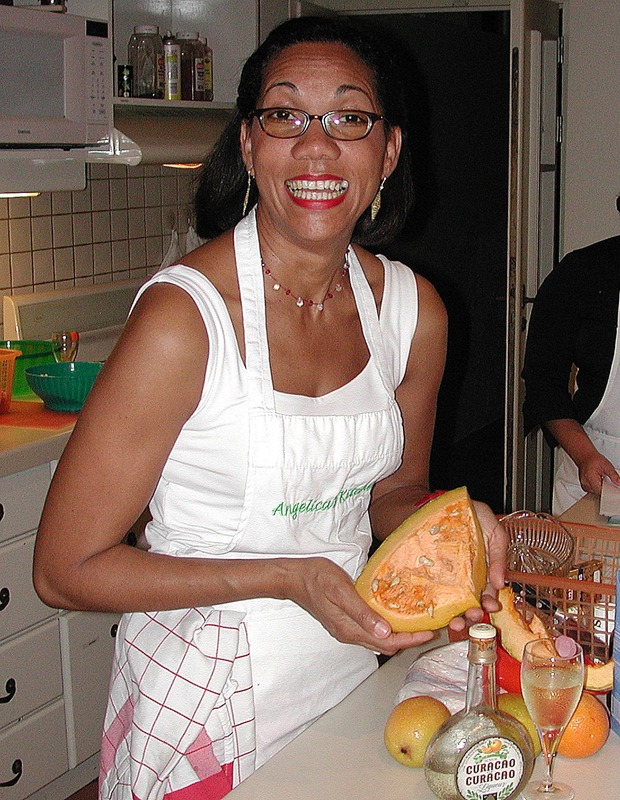 Since 2002, native Curaçaoan Angelique Shoop has been inviting the public into her kitchen to cook. “All you require is an appetite and apron to play the roles of chef and gourmand,” she told us. 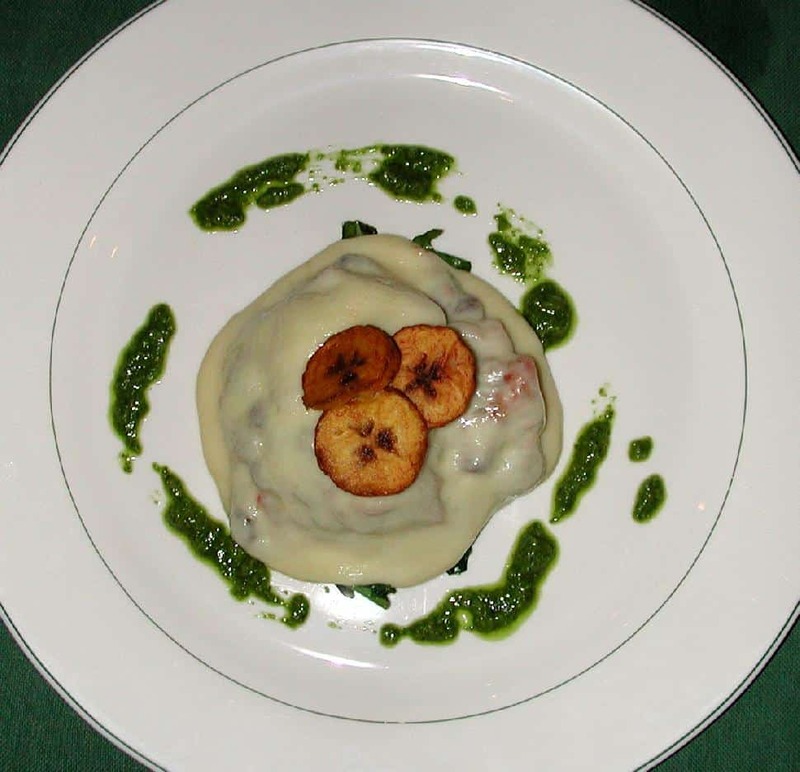 The food is based primarily on French or Italian cuisine with local influences. A group of 10 people will generally prepare a four-course meal in her large kitchen with its twin preparation islands. Divided into smaller groups to create separate courses, a friendly competition developed among the teams to see which could create the most delectable dish for the evening’s dinner. Cajoling and cooking, our collective groups prepared a fine meal, including salsa, codfish salad, beef with Caribbean vegetables and funchi. All were washed down with some fine Chilean wine and followed by pumpkin pancakes with Curaçao liqueur sauce – naturally. I believe the best way to experience Curaçao is to feast your eyes and feed your appetite.